Back in the days of yore when this blog was practically brand new, I featured Vana Chupp's lovely company, Le Papier Studio. I've always admired silhouettes and have to say Vana has found more ways to present them than I could ever have imagined. Art prints, stationery, jewelry, ornaments, pillows, plates... and that's just the tip of the iceberg! In keeping with our paper theme around here, Vana is offering a generous, worldwide giveaway that features her elegant 2012 wall calendar and a set of personalized holiday cards. 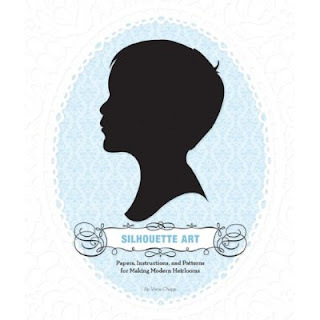 Another thing that Vana has done beautifully is create a kit for Chronicle Books that's titled Silhouette Art - Papers, Instructions, and Patterns for Making Modern Heirlooms. It details the way Vana makes her lovely silhouettes using a photograph as a guide, and includes paper supplies for you to do the same. With a bit of practice, you'll be able to "transform the apples of your eye into artistic heirlooms." Now back to the giveaway... To clarify, two winners worldwide will be selected at random and each person will receive both the calendar and a dozen cards. 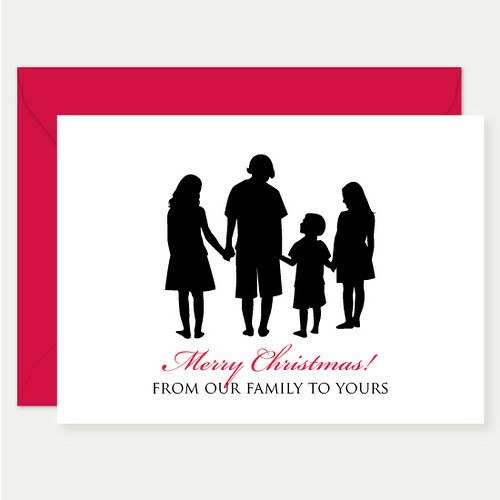 The cards include the option of customization using your very own photograph. To enter, please visit Le Papier Studio and then return to this post to name your favorite item in the shop. Be sure to include your email address within your comment if you don't have a blog or website where your address is readily available. 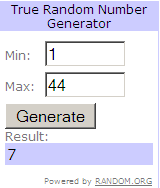 I will need it to notify you if you are one of the lucky winners. The giveaway will close at the end of Saturday, the 19th. Winners will be announced on this post and on the All Things Paper Facebook page the next day. Good luck! Please note: I've not received compensation in any form from Le Papier Studio in exchange for doing this giveaway. Congratulations to Maureen and Jan Castle! They've been notified by email. Thanks very much for entering everyone, and take heart if you didn't win this giveaway as there will be a couple more coming up before the holidays! This is so beautiful! Thanks for the link to the video Ann, I feel inspired to try paper cutting .I liked her silhouette plates a lot. wonderful giveaway ! I really love both the calendar (and don't have any for 2012 yet) and the cards ! in their shop, I also love the silhouette pendant, very cute ! My favorite is either the 2012 wall calender or the fairy on the branch card set. Beautiful!!! I love the paperweights and the jewelry! There are so many beautiful things in this shop, it's hard to choose! So much there to view! I like the Bird on Berry Branch placemat. 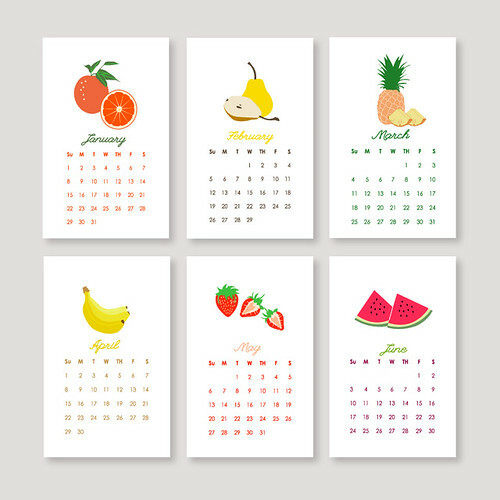 I am in love with the fruit calendar. I would love the same printed on tea towels or placemats. Gorgeous! I've been on a bit of silhouette-kick lately ... possibly (a *BIG* possibly) going do something silhouette-related as a Christmas gift for my parents. Favorite item from the shop: silhouette pendant necklaces. 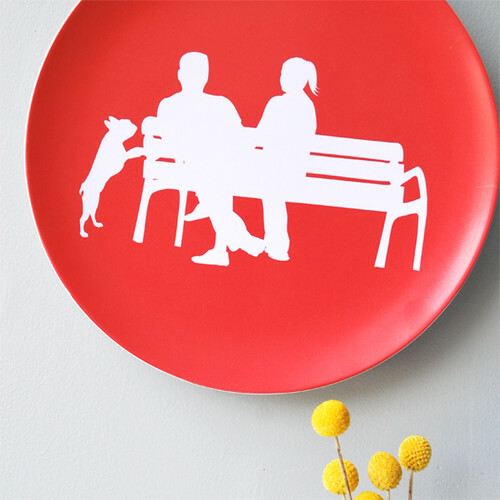 Everything looks so beautiful... if I had to pick my favourite, it would be the couple silhouette http://lepapierstudio.com/-c-172/a-ride-with-me-p-373 ! I like this best " Silhouette Advent Calendar - DIY Kit". I really loved "Custom Silhouette Charm Necklace"
Wonderful idea...I just loved the jewellery, Silhoutte famly tree and the Silhoutte plate. Everything here is so lovely. I especially like the 'fairy on branch folded cards' and the 'hummingbird cards'. Thanks for the giveaway! Very generous of Vana to make and share a video of how she makes her silhouettes. All of her work is so "clean" and crisp and would be a beautiful addition to any home. I especially love the fruit calendar. Paper craft has always fascinated me...Ideas for sketches always open. Your blog sure is an inspiration! Followed the link to your blog after you commented on a post of mine. I love it! After visiting le papier studio, I really like the poppy branch flat stationary cards. Beautiful in the red and blue! Love the jewelry and pillows. The Silhouette cards are amazing!! So personal! Love the silhouettes articles but my favorite is the CD calendar. I especially like the fruit calendar!!! Great stuff...thanks for the chance to win. 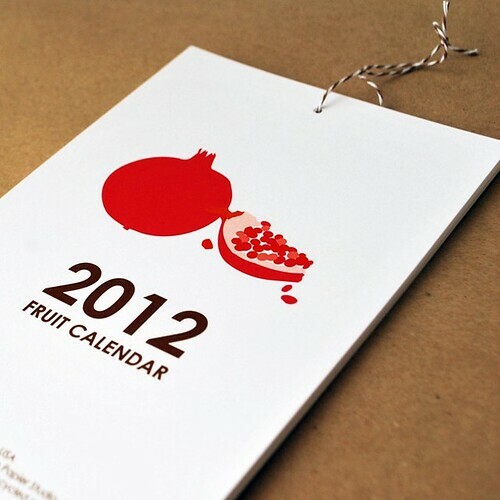 I love that fruit calendar. thanks! The silhouette calendar poster is my favorite - that would bring the perfect touch to my cubicle all year long! Wow!all items from Le Papier studio are lovely. I love the 2012 calender, the Oh deer! 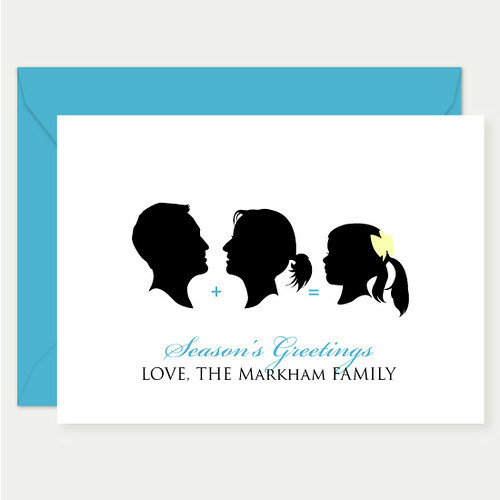 and the snowman card and the Couples silhouettes in fine art section. I love paper cutting and I really really hope to win this one! Gorgeous work, and a fantastic giveaway, thanks Ann!! I am fascinated by silhouettes and their enduring charm. With a new baby on the way in our family, I can just picture a lovely holiday card to commentate Baby Emmy 's birth. I LOVE the "Monogram and Silhouette Necklace!" Her items are gorgeous! Such a creative way to do holiday cards! 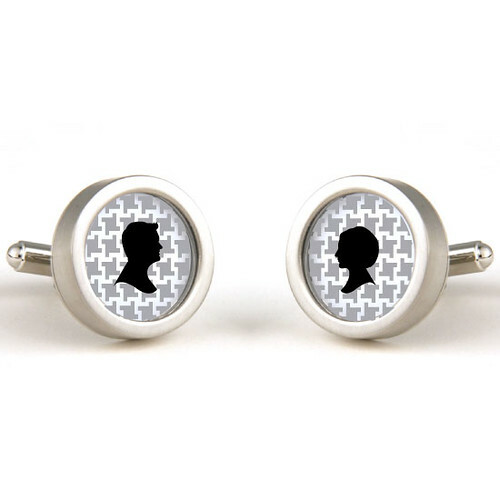 I also adore the Silhouette ring with yellow pattern. I really like the pet silhouette art prints! The Scottie Christmas cards are cute too. I like the full body silhouette family picture. Love the "oh deer!" 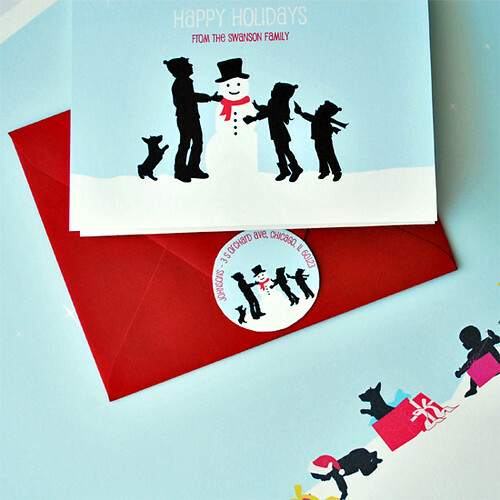 and snowman cards! so cute! 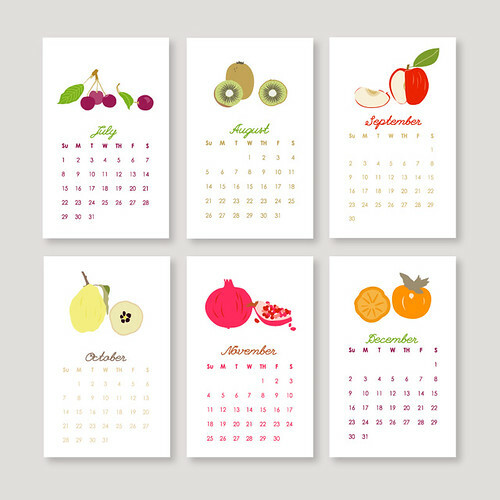 and the fruit calendar on your blog. I really enjoy your blog by the way... especially the quilled snowflakes. I am going to try to do some for my holiday decorations since I am trying to do everything on a budget. Thanks for the inspiration! 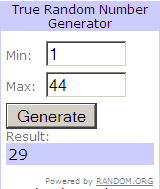 The giveaway has ended as of Saturday night, the 19th. Thanks for entering, everyone!